Yesterday Jim’s friends gathered to remember his life and spread some of his ashes on a meadow in central Texas. Jim was a multi-talented man with many interests, generous with his time and skills in helping others, including me. Jim solved computer glitches. Jim helped my husband finish building Cloud Pavilion, one of our rain barns that collects water for wildlife on our (dry) property. Jim designed jigs to help New World Arbalest produce better bolts for their crossbows. And I heard of many more things Jim did to help others, in the years that I knew him. Jim also suffered from serious mental illness that sapped his energy and his joy, worried his many friends, and finally ended his life, in a successful suicide several weeks ago. In some belief systems, this is unforgiveable. In some peoples’ minds, it’s cowardice and moral weakness. But suicides, like homicides, come in many varieties. Jim had been in treatment, with multiple drugs, with multiple interventions and hospitalizations, over the years. This was not a person who chose “a permanent solution for a temporary problem” but a person who, after the many failures of therapies and drugs, could only see his as a permanent problem that became ever more intolerable. Exactly like someone with an incurable physical illness that causes them great pain or loss of mental function and causes great distress to those who love them. Although there are advocates for assisted suicide for those with such physical problems, there are none for those with incurable mental problems–and I understand the reasons very well. I also understand why those with long-standing mental illness that does not respond to treatment may choose suicide. Our autistic son, to my surprise, spoke up as others did–but differently in that he was typically blunt about what happened…others skirted the reality, but our son said, along with other things, “I’m sorry Jim killed himself.” It’s the part we all–all Jim’s friends–had a tough time getting around. We knew he was hurting. We tried, in various ways and amounts, to be supportive and helpful. It wasn’t enough. We’re all sorry he killed himself. And yet…as with any terminal illness…there’s also a little guilt-producing relief. No more suspense. No more worry if it’s safe to leave the house for an hour or so, if it’s safe to let the other person out on his own. It’s over…for Jim, and for us. Those of us who have also suffered depression wrestle with the guilt that for us, the treatments worked–why not for him? Why were we the lucky ones?–but also have the relief of having made it through a dangerous passage, and the fear that maybe, someday, we won’t. But right now–we’re here, and understanding a fellow sufferer’s reasons. There may be survivor guilt in some hearts, but there’s also survivor joy, and a reminder that even if, in our own dark hours, we can’t really believe anyone could love a severely depressed person…right now the evidence is clear that people do. We were blessed in having space to offer–a meadow where Jim had walked whenever he came to visit, a meadow brilliant gold with wildflowers in the spring, as a place for the gathering and spreading of ashes. And a house in which to hold the reception afterward, both room to gather and room to be separate for those who needed a little more time, and that alone. It’s summer here now, and dry, with cracks in the ground, and the meadow is brown…but I’d sent pictures of it in spring to Jim’s family and some friends. It often functions as it does for me, as a breathing space, a space where people can go out in turmoil or distress, and come back calmer, having let the land itself speak–the silence, the shapes of beauty, a space that isn’t already full of human things and human opinions and human distress. The rest of the time, as people came back from the meadow where the ashes were spread, was spent (as usual at such times) in eating a lot and talking a lot–some more Jim stories, and other topics as well. The only difficulty, for the person in charge of arranging the material side of things, was not knowing how many would come, or what those bringing food might bring. Of course we ended up with too much…but equally of course, that was the right amount. I’d been told there might be twenty coming. Calculated for 25-30. And we had a full three dozen….with enough food for more. People ate and ate and ate (as they need to do at such times) and consumed gallons of iced tea, punch, and sodas, as well as water. (Did I mention it was HOT??) And talked, of course. As time went on we had the main group (in the back room, the largest) and satellite groups in the kitchen, the living room, and outdoors in the carport near the ice chest. One of the guests made a plaque to hang on the rain barn Jim helped build, with the names of the men who worked on it. We’ll have a little ceremony when we hang it up (that rain barn is too far away to make people walk it on a very hot day, and the fire danger’s too high to drive there.) Even with chairs out in the meadow, some people were having heat problems. The best of Jim, the happiest of Jim, was present yesterday, in the memories of his friends–friends he often doubted he had. Though we cannot forget his misery, his mental anguish, we can and will remember the times Jim was happy, the times Jim was fully here for us. 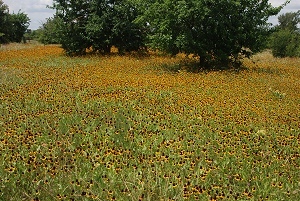 This is the meadow--earlier in spring of course--where part of Jim will always be. In some peoples’ minds, it’s cowardice and moral weakness. There are times when suicide is about cowardice and/or moral weakness and times when it is very selfish, but when someone who is tormented by mental or physical problems becomes unable to stand any more of them, that's just plain sad. It is good that you were able to provide a location for this remembrance of your friend. It was a blessing to us to have something we could do. It is so sad; I have known two people who died from depression, and one always feels so guilty - could I have done anything? In one case, I know I could not, and his widow seems to be coping remarkably well (or putting up a front, I am not sure which); in another - well, had I known her better, had we been real friends rather than acquaintances who only quite liked each other.... well, we are not told what would have happened. I grieve with thee. And I understand, from both sides. May your friend find peace where next he goes. Great story well told . RIP,or in Hebrew ז"ל -"let memory of him be blessed" . My condolences to you and your friends for your loss. As one who suffers from chronic depression, I sometimes find myself contemplating my own exit. I cannot take the drugs- I use diet and exercise and carefully choreographed activities to keep the worst of the shadows away. But they still come unbidden. And they may win. It sounds like you had a very good wake for him. I feel, when all is said and done, that a person who can leave behind memories and lessons for everyone who loved him or her is a person who lived the best life they could have. Despite his problems, it sounds like Jim did. My husband was not a weak man. He was an Airborne Infantryman; a member of a Army Special Operations command. He was a hunter, an outdoorsman, a long time member of the SCA. He loved rock climbing and helping friends. In the darkness of the night in Oct 2009 - that time between one day and the next - he made the decision that after a lifetime of trying to make sense of the inside of his mind - of years of therapy and of medications, of long walks deep in the woods trying to understand, he could no longer battle his demons. He went to meet The Lord and The Lady and rest in the comfort of Their Arms in the Summerlands. This last January would have been our 23rd year together. I'm still conflicted in so many ways, but I know that I never could and never will know what it felt like to be inside his mind. I have my own demons and I'm sure he never really understood them as well. I know that it still hurts that he made that decision and took that step. I know I still have a big 'Him' shaped and sized hole inside of me and will be until it's my time to Walk the Lands Where No Shadows Fall. All I know is that when I saw his mortal husk for the last time, he looked truly at peace. And that it was his live to live in the way he knew to be the best for him. Much love to you, lady. My sympathies and thoughts with you, and Jim's loved ones. I, too, understand his struggle and conflict, and truly appreciate that he had thoughtful, kind friends such as yourself who saw and appreciate him, and helped to enrich his time and spirit. It's a raw and difficult thing when a fellow ultimately cannot rest and be at peace here in this physical life, but our world is a complex, confusing, and contradicting place, and unfortunately it can be those gifted with qualities such as intelligence and sensitivity that are worn down more consistently, or less capable of switching off enough when it's necessary. I really like what you wrote about Jim. No words can fully explain a man, but I think yours gives an accurate impression which touches my heart. He was loved, and the world is a richer place for having known him. That looks like a wonderful memorial. I am so sorry for your loss. Thank you so very much for this portrait of a wonderful man.